District town, government of Courland, Russia. According to the census of 1897 the population was 6,543, including some three thousand Jews. The principal occupations of the latter are commerce and handicrafts, Jewish artisans numbering 295. About 150 families yearly receive alms at Passover. Two government and three private schools are attended by 50 Jewish pupils;the Talmud Torah, by 70 children. Besides, private teachers give instruction to about 130 children. 1. Rabbi Mordecai ben Abraham Rabbiner. 3. 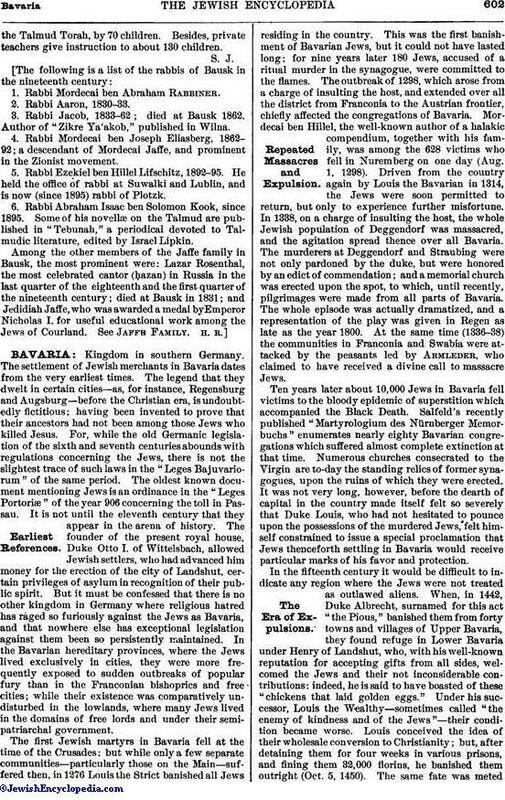 Rabbi Jacob, 1833-62; died at Bausk 1862. Author of "Zikre Ya'akob," published in Wilna. 4. Rabbi Mordecai ben Joseph Eliasberg, 1862-92; a descendant of Mordecai Jaffe, and prominent in the Zionist movement. 5. Rabbi Ezekiel ben Hillel Lifschitz, 1892-95. He held the office of rabbi at Suwalki and Lublin, and is now (since 1895) rabbi of Plotzk. 6. Rabbi Abraham Isaac ben Solomon Kook, since 1895. 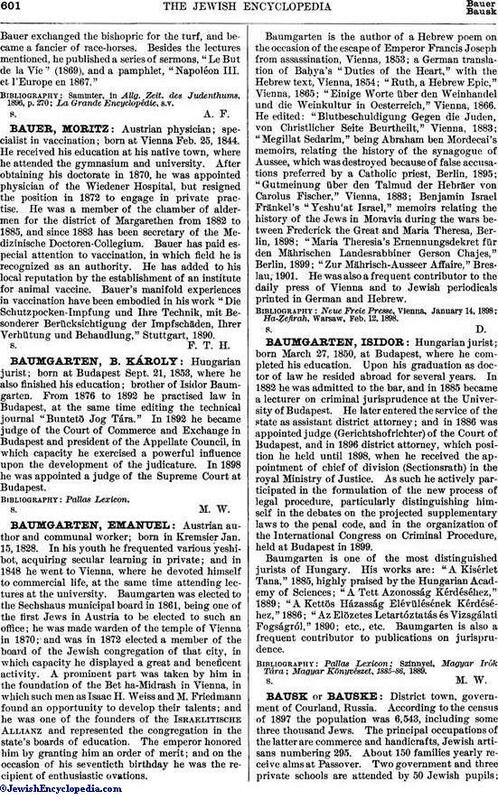 Some of his novellæ on the Talmud are published in "Tebunah," a periodical devoted to Talmudic literature, edited by Israel Lipkin. Among the other members of the Jaffe family in Bausk, the most prominent were: Lazar Rosenthal, the most celebrated cantor (ḥazan) in Russia in the last quarter of the eighteenth and the first quarter of the nineteenth century; died at Bausk in 1831; and Jedidiah Jaffe, who was awarded a medal by Emperor Nicholas I. for useful educational work among the Jews of Courland. See Jaffe Family.